America’s Next Top Gay Rapper? 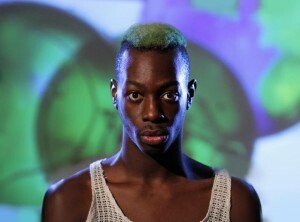 “I’m proud to be called a gay rapper,” Le1f says, “but it’s not gay rap. That’s not a genre.” The flamboyant artist has been making waves this week after talking about homophobia in the hip hop world in the wake of Frank Ocean’s own coming out. And while the reactions have been mixed (with a certain amount of ire coming from the hip hop world and praise from gay fans), the New Yorker recently released a video for his latest single “Wut,” one that spotlights the rapper’s own love of purple short-shorts and booty shaking. Le1f’s energetic album Dark York has been available since April and includes a few catchy riffs and rapid-fire rhyming. What to also expect from this emerging hip hop queen? Subversive lyrics and funky beats that remind us a little of Bounce great Big Freedia. The track “Gayngsta” even features Philly artist Don Jones (both guys graduated from Wesleyan).